The May Uprising took place in Dresden, Kingdom of Saxony in 1849; it was one of the last of the series of events known as the Revolutions of 1848. In the German states, revolutions began in March 1848, starting in Berlin and spreading across the other states which now make up Germany. The heart of the revolutions was in Frankfurt, where the newly formed National Assembly, the Frankfurt Parliament, met in St Paul's Church from May 1848, calling for a constitutional monarchy to rule a new, united German nation. To form the Assembly, near-democratic elections had taken place across the German states; the majority of the members were Saxon democrats. 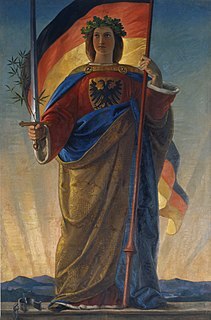 On 28 March 1849 the Assembly passed the first Reichsverfassung (constitution) for Germany, and in April 1849, Friedrich Wilhelm IV of Prussia was offered the crown. Despite its apparent progress, the National Assembly really depended upon the co-operation of the old leaders and Emperor; this became all too clear when Friedrich Wilhelm IV refused to accept the crown in disgust. Movements sprang up across the German states to force through the new constitution but the National Assembly disintegrated. In Saxony, Frederick Augustus II had never recognised the constitution, and now also disbanded the Saxon parliament. In Württemberg the more radical elements of the National Assembly formed a rump parliament in Stuttgart, which was defeated by Prussian troops. At the same time, the people of Saxony began to react to the repression of the democratic movement — the May Uprising began. Revolutionary war medal of the May Uprising in Dresden, Kingdom of Saxony, 1849, obverse, showing the street fighting. 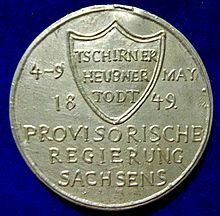 The reverse of this medal shows the names of the leaders of the provisional government Tzschirner, Heubner and Todt, and the dates of the uprising. At first the Saxon town councillors attempted to persuade Frederick Augustus II to accept the constitution in public speeches. The municipal guards who should have controlled them were on their side and made an address to the King, also calling for acceptance of the constitution. The King was unyielding, however, and called them to order. This led to further unrest, which in turn caused the king to bring in Prussian troops; the situation exploded. On 3 May 1849, the municipal guards were told to go home, but the town councillors organised them into defensive units to stop expected Prussian intervention. As the people's anger grew, the government withdrew into the castle and the armoury (Zeughaus), protected by Saxon troops. The municipal guards were undecided whether or not to support the people, who threatened to use explosives to get the government out. In response the Saxon troops fired on the crowd. Within hours the town was in chaos, with 108 barricades erected. In the early hours of 4 May 1849, the king and his ministers managed to escape and fled to the fortress of Königstein. Three members of the dissolved Democratic parliament now became the leaders of the revolution: Samuel Erdmann Tzschirner, Karl Gotthelf Todt and Otto Leonhard Heubner formed a provisional government. Their aim was to force the acceptance of the constitution. Tzschirner called in another member, Alexander Heinze, to organise fighting and bring in more communal guards and volunteers from outside Dresden. Reinforcements joined the revolutionaries from as far away as Chemnitz, Zwickau and Marienberg, and the struggle grew extremely violent. The Saxon troops were also backed up by arriving Prussian soldiers. They planned to encircle the rebels and corner them on the Altmarkt (Old Market), but the number of barricades meant they had to fight for every street, even in the houses. Recent studies place the number of revolutionaries at around 3,000, compared with 5,000 government troops from Saxony and Prussia. Apart from being outnumbered, the rebels were also untrained in battle, disorganised and lacked weapons, so they stood little chance of success. On 9 May the majority (1,800) were forced to flee. Most of the others gave up, and the rest were tracked down to the Frauenkirche and arrested. Before the events of May 1849, Dresden was already known as a cultural centre for liberals and democrats; the anarchist Dresdner Zeitung newspaper was partly edited by the music director August Röckel and contained articles by Mikhail Bakunin, who came to Dresden in March 1849. The Saxon government later accused Bakunin of being the revolutionaries' ringleader, although this is unlikely to have been the case. Röckel also published the popular democratic newspaper Volksblätter. Richard Wagner the composer, at the time Royal Saxon Court Conductor, had been inspired by the revolutionary spirit since 1848 and was befriended by Röckel and Bakunin. He wrote passionate articles in the Volksblätter inciting people to revolt, and when fighting broke out he took a very active part in it, making hand grenades and standing as a look out at the top of the Kreuzkirche. The architect Gottfried Semper was until 1849 less politically active, but had made known his democratic beliefs and felt compelled to stand up for them, also taking a lead role on the barricades. Others on the barricades included Pauline Wunderlich, Gustav Zeuner, Ludwig Wittig (main editor of the Dresdner Zeitung); the actress and singer Wilhelmine Schröder-Devrient supported the uprising. The struggle left some Dresden buildings in ruins: the old Opera, two sides of the Zwinger and six houses were burned down. The number of dead rebels is uncertain but in 1995 the figure was estimated at around 200; 8 Saxon and 23 Prussian soldiers died. The Saxon government arrested Bakunin and Röckel in Chemnitz, but Tzschirner, Heubner and Todt escaped. Todt died early in his Swiss exile at Rießbach in 1852. Semper and Wagner were on the government's wanted list, but also escaped, to Zürich, where Wagner remained. From 1849 the German states saw a sharp rise in emigration as thousands deserted their homeland for political reasons, many of them artists, writers and other well-educated, prominent members of society. The revolution had a slight effect on the political system, in that the nobility lost some of its power in the lower house, but otherwise was a complete failure. Reference: Dresdner Hefte, Heft 43 (1995), Der Dresdner Maiaufstand von 1849 (The Dresden May Uprising of 1849), published by Dresdner Geschichtsverein e.V. ^ Helge Dvorak, Todt, Carl (Karl) Gottlob (2005). Biograhisches Lexikon der Deutschen Burschenschaft (in German). Politiker T-Z. Heidelberg: Universitätsverlag Winter. pp. 46–47. ISBN 3-8253-5063-0. Frederick Augustus II was King of Saxony and a member of the House of Wettin. Louis-Eugène Cavaignac was a French general who put down a massive rebellion in Paris in 1848, known as the June Days Uprising. This was a 4-day riot against the Provisional Government, in which Cavaignac was the newly appointed Minister of War, but soon had to be granted dictatorial powers in order to suppress the revolt. By adopting ruthless methods, he achieved his objective, though some have claimed that he spent too long preparing for the operation, allowing the mob to strengthen their defences. He received the thanks of parliament, but failed to be elected president, losing heavily to Louis-Napoleon Bonaparte. The Erfurt Union was a short-lived union of German states under a federation, proposed by the Kingdom of Prussia at Erfurt, for which the Erfurt Union Parliament, lasting from March 20 to April 29, 1850, was opened at the former Augustinian monastery in Erfurt. The union never came into effect, and was seriously undermined in the Punctation of Olmütz under immense pressure from the Austrian Empire. Karl Theodor Ferdinand Grün, also known by his alias Ernst von der Haide, was a German journalist, political theorist and socialist politician. He played a prominent role in radical political movements leading up to the Revolution of 1848 and participated in the revolution. He was an associate of Heinrich Heine, Ludwig Feuerbach, Pierre-Joseph Proudhon, Karl Marx, Mikhail Bakunin and other radical political figures of the era. Though less widely known today, Grün was an important figure in the German Vormärz, Young Hegelian philosophy and the democratic and socialist movements in nineteenth-century Germany. As a target of Marx's criticism, Grün played a role in the development of early Marxism; through his philosophical influence on Proudhon, he had a certain influence on the development of French socialist theory. Carl August Röckel was a German composer and conductor. He was a friend of Richard Wagner and active in the Revolutions of 1848. The Palatine uprising was a rebellion that took place in May and June 1849 in the Rhenish Palatinate, then an exclave territory of the Kingdom of Bavaria. Related to uprisings across the Rhine River in Baden, it was part of the widespread Imperial Constitution Campaign (Reichsverfassungskampagne). Revolutionaries worked to defend the Constitution as well as to secede from the Kingdom of Bavaria. The Battle of Kirchheimbolanden was the first battle in the Palatine Uprising of 1849. It took place on 14 June near Kirchheimbolanden and ended in the defeat of the volunteers (Freischaren) by the Prussian Army. The Battle of Ludwigshafen and the subsequent bombardment of Ludwigshafen lasted from 15 to 18 June 1849 and was part of the Palatine Uprising and Baden Revolution. The young settlement of Ludwigshafen was badly damaged by the shells of the Baden artillery and the resulting fires. The Imperial Constitution campaign was an initiative driven by radical democratic politicians in Germany in the mid-19th century that developed into the civil warlike fighting in several German states known also as the May Uprisings (Maiaufstände). 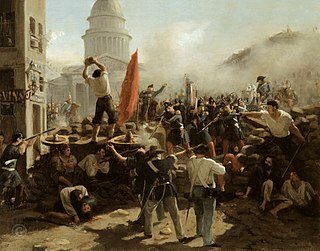 These conflicts against the counter-revolutionaries began in May 1849 and varied in length and intensity depending on the region. Some lasted until July that year. They marked the end phase of the popular and nationalist March Revolution that had started a good year before in March 1848.